In today’s world of advanced medicine and technology, people are living longer, healthier and more active lives. Skin degradation and imperfections, and unavoidable aspect of time, are not just the bane of old age. Premature aging of the skin from exposure to the sun, heredity, hormones, and rosacea, can often have a negative impact on careers, social life and self image. Due to the ever-growing call for procedures that improve appearance, eliminate sunspots, pigmentation, facial veins, red blotches, and minimize lines and wrinkles, a practical, efficient and safe solution is more in demand than ever before. 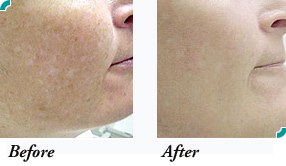 Initially branded as IPL (intense pulsed light) when it was a brand new technique, using laser and light energy to treat each skin imperfection safely and with minimal risk, the improved version of IPL is referred to as LHE or light heat energy. Photorejuvenation takes just ten minutes with no preparation or downtime. It gives you the opportunity to squeeze in a lunch hour appointment and still have plenty of time for lunch. Noticeable improvement in pigmentation, facial veins, red blotches, and fine lines and wrinkles occur after just a few treatments. Using the advanced LHE technology, precise amounts of light energy is delivered to the skin’s surface. Treatments are spaced at three week intervals. The energy is delivered at specific settings for each treatment to maximize your results. Rejuvenation is designed to combat the effects of aging and damaged skin in a softer, gentler way. The advanced LHE technology can remove 90-95% of pigmented spots effectively. The redness and flushing of rosacea can be reduced 80-90%. The light energy stimulates the production of collagen, reducing pore size, fine lines, and wrinkles. It can be used to treat the full face, neck, chest and even the hands and is also effective in treating acne. The best candidates for photofacial rejuvenation have red, flushed faces, unsightly facial veins, sun-damaged skin, hyperpigmentation, or enlarged pores. Why not contact us today to see what photofacial rejuvenation can do for you?